Developed by naval architect Gian Marco Companino, the Momentum line is inspired by the great yachts of the 1930’s & 1940’s with traditional lines that have evolved into a new contemporary concept. 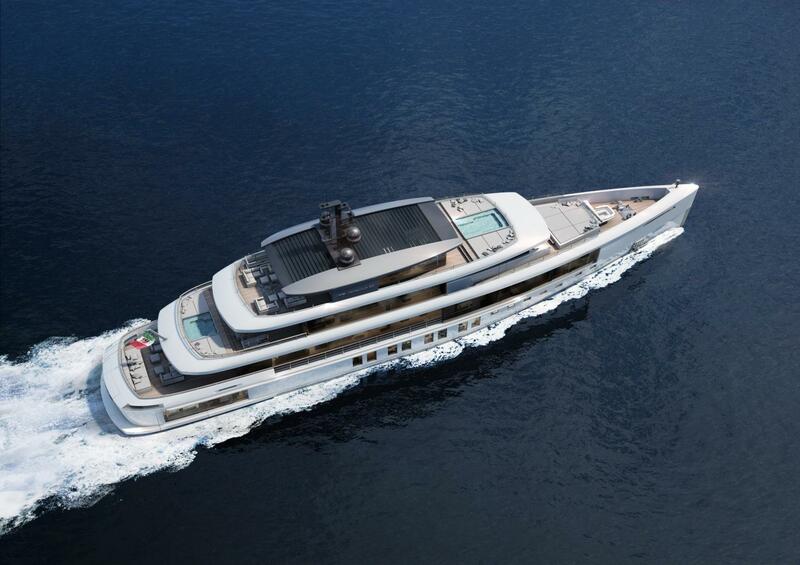 The Momentum line features all the luxury design elements one would expect onboard a yacht of this stature, yet never excessive which is a tribute to the great architect Mies Van Der Rohe. 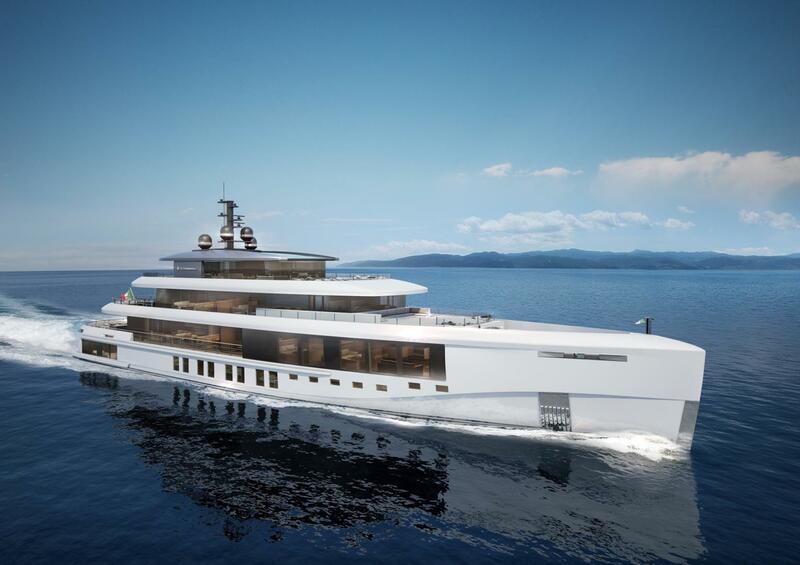 Characteristics of the interior are integrated swimming pools, a beach club & spa completely open to the sea, vertical full-length windows for both the master & guest cabins, and glass is used throughout the superstructure inviting guests to enjoy the view from wherever they are traveling. The M57 Momentum Explorer is a large volume 820 Gross Ton full displacement motor yacht that features a high tensile steel hull with aluminum superstructure. She offers an Ice Class option and has a 5,000nm range at cruise speed with her Caterpillar 3512 (1380kw @ 1600 RPM) engine package & zero speed stabilizers. Important to note that she is rated for touch & go helicopter operations with a landing zone on the upper deck. 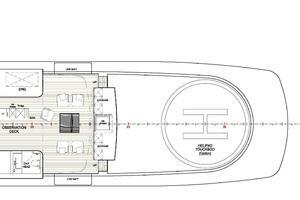 As you can see from the profile lines she has an open aft deck which is common across the full range of Momentum Explorer yachts. On the 57m she is purposely built to carry a submersible on the aft deck area just aft of the beach club/garage area which has a fold-down balcony. This space has a day head & can be used as a spa area or dive center. The main deck aft is where the tenders, jet skis, rescue tender and other water sports equipment are stored. When the deck is cleared it is great for entertaining or lounging. The use of glass throughout the superstructure lets natural light flood the interior décor. 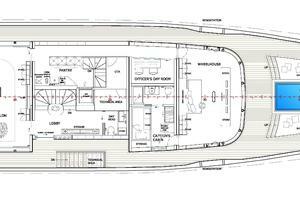 Formal dining for 12, 10 guest cabins sleeping 12 guests including a massive on deck master that has an office area, walk-in wardrobe, his & hers baths with Jacuzzi tub & rain shower. A nice touch is a private balcony. Both the main salon & skylounge offer excellent views and spaces for relaxing. 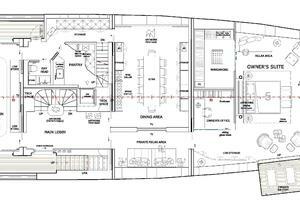 The Upper deck has a cabins cabin, officers room, pantry and the main exterior dining area aft, and large pool forward towards the bow. The sundeck is extremely private and offers the best views onboard when cruising the polar regions or remote Pacific islands. 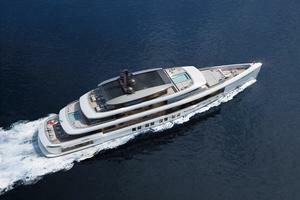 She has a strong bow profile and is a true explorer yacht. Each Momentum Explorer is custom built at the request of the individual client from exterior hull & superstructure paint, to deck layouts, interior décor styles, and tender arrangements. The interior décor renderings that are included in this presentation are only meant to give the client an idea of the space & styling that Admiral can create. The design center at the Admiral Shipyard in Marina di Carrara is one of the finest in the world featuring thousands of swatches of fabrics, samples of the finest stone & marbles, leather, teak, wood paneling, suede. It is any designers dream. The shipyard welcomes client to involve their private designers to get involved in the project or the client can utilize the in-house team. Standard accommodations feature 5 spacious cabins sleeping 10-12 guests with a crew capacity of 10 including private captain’s cabin behind the wheelhouse. 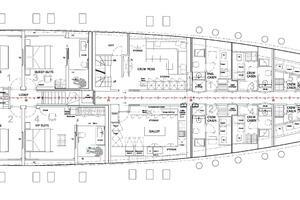 The interior layout (GA) can be customized to suit any client’s needs including a beach club, gym and massage area accessible from the lower deck guest staterooms. A large full beam master stateroom is located forward on the main deck with owners office and walk-in closets & ensuite amenities. A private owner’s balcony is a great feature for enjoying a coffee in the morning or privacy while at anchor. For the main salon & dining areas both located on the main deck, you will really start to pay attention to the use of glass and how much natural light is allowed into the interior. The bridge deck sky lounge has a bar and seating area providing a comfortable environment to relax with some of the best views on board. There is alfresco dining that can easily seat 12. Tender capacities on main deck aft can accommodate a tender up to 7.50 meters + rescue tender 3.20 meters, space for addition jet skis, sea bobs & other watersports toys. 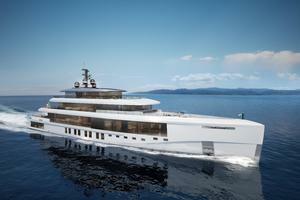 What is special is that the main deck aft will also double as a touch and go helicopter landing pad. On the foredeck, you will find a sunning area around a generously sized pool. The Italian Sea Group is nowadays one of the greatest Group in the yachting industry featuring financial strength & stability. The yard is thriving both with new construction projects as well as its refit division attracting some of the highest quality yachts in the world to Marina di Carara to take advantage of their facility & seasoned craftsman. The Group features the capability to offer a total luxury experience, made of quality, attention to detail, design, art, innovation, the real essence of Made in Italy. 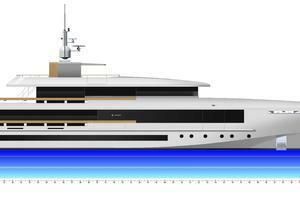 Admiral is the flagship brand of The Italian Sea Group, The definition of luxury, quality, and design. Its diversified fleet range consists of ten distinct series from 37 to 145 meters. ADMIRAL has launched 142 yachts since 1966. This is the corporate philosophy of The Italian Sea Group and of the brand Admiral as well. This is the starting point for each of the 25 interior designers who work in the design team of the Italian Sea Group, the productive and creative area of the Group that makes customized interior proposals for the customers to meet their needs. An endless selection of prestigious materials such as wood, marble, refined cloths, leather and various accessories that allow the Owner to turn into reality the yacht of his own desire. The Owner is carefully followed by the team in every step and choice with accuracy to reach the ideal perfection of the interior design. The new Headquarters, recently restored, boasts an innovative design concept where co-operation is the key-word of the project; the headquarters is not limited to management duties but it is also opened to other areas, such as the world of the art, the design, the food and the ‘Made in Italy’ products. The main purpose is to offer to customers, suppliers, and visitors a full experience of Italian Culture and Lifestyle. A 200 m drydock, floating barge of 2,200t for yachts up to 90 meters, a berth of more than 2,000 mts with a crane capable of lifting up to 200 tons, these features make possible the operation and works on yachts, super yachts and mega yachts up to 200 meters long. The Group features 100,000 square meters of production area with 11 fully restored and renewed sheds including carpentry, upholstery, steelworks, a showroom, a team for technical support and design composed of 45 specialists among engineers and interior designers. In the recently re-modernized 1000 sq. mt. steel workshop, the production of the stainless steel external and internal yacht components takes place. The internal production guarantees a major control of the productive cycle and makes it possible to avoid externalizing our unique design and know-how further safeguarding our quality and exclusiveness and respect of production times. Located in our general headquarters in Marina di Carrara, the area dedicated to upholstery is a space of 1,200 sq. mt has englobed 8 resources. It is equipped with the best technologies and tools to better manage in-house the entire production cycle. Here, all workmanship is carried out: from the leather and cloth filling to the tapestry details, from the curtain decorations to the pillow-work, from the rubber incisions to the external protections. With the Group’s recent acquisition of Celi Carpentry, one of the most important Italian companies specialized in ebony craftsmanship, NCA Refit, guarantees the highest quality of wood craftsmanship to its clients. Thanks to the knowledge and competencies acquired in almost 100 years of activity (Celi was founded at Terni in 1920), our shipyard can count on a strict methodology construction and advanced technologies in the ebony workmanship preserving all the values and qualities of “hand-made”. The group’s creative area takes advantage of a team of 25 designers which elaborate and offer proposals of “tailor-made” interiors and can satisfy every single client’s requirement and request, guiding them with professionalism and competences in all the project phases. 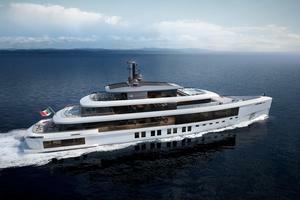 The maniacal attention for every small detail and the possibility of choosing among an infinite collection of marbles, precious wood, refined cloths, soft leather, luxury objects and décor accessories transform a Ship Owner’s dream yacht into reality. The excellence of navigation, 100% made in Italy. Style, efficiency, and know-how are the true essence of the Group: this is what makes important Shipowners and Commanders choose The Italian Sea Group. During the 1950s Admiral started their production of wooden yachts under the brand ‘Arcobaleno Super’, which then became ‘President’. The first ‘Admiral’, 18 meters long and made of wood in 1966 was the natural evolution. In the middle of the 1970s, the ‘Cantieri Navali Lavagna’ launched the first 30-meter motor yacht made of wood. 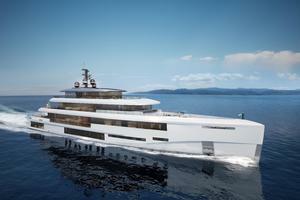 This yacht, until then rarely built by other shipyards meaningfully contributed to the growth of the brand. 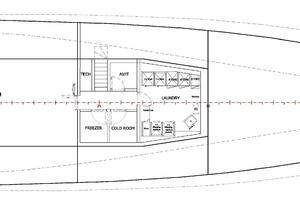 Thanks to the huge growth of “Admiral” the passion for planning yachts began. During the 1970s the historical vessel called “MAU MAU”, 34 meters long put to sea and thanks to its four powerful engines made a top speed of 32 knots. “SAHARET”, “IPSUM”, “ERAF”, “KADIA”, “SAUDADE” and other several yachts more than 30 meters long, were conceived and built in a period when the average dimension wasn’t greater than18 meters. Having chosen the path of high-performance and high-safety at sea, building Admiral yachts required the use of light alloy and in 1982 the shipyard launched the first light alloy ADMIRAL of 23.50 meters. 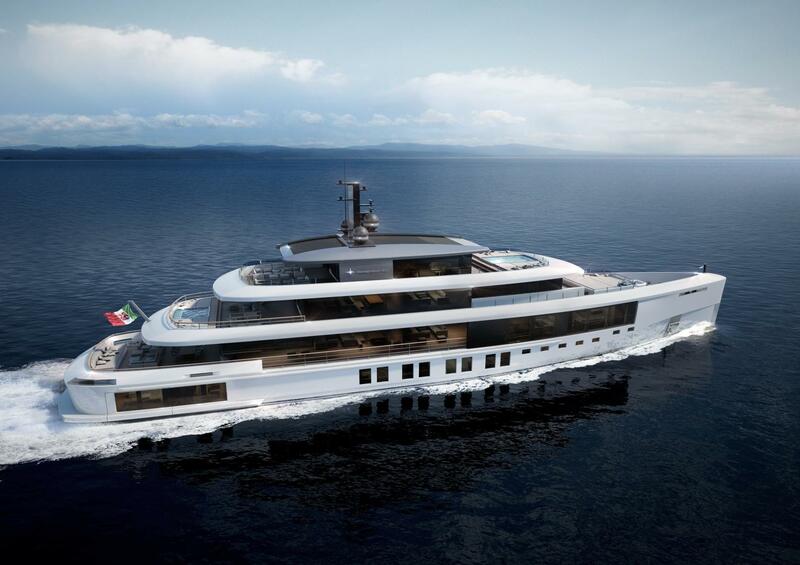 Since then the Admiral brand has been characterized by steel and aluminum yachts guaranteeing high solidity according to weights and contents, maintaining high-speed performances, whatever the sea condition in maximum safety. “The Admiral yachts range completes the Tecnomar portfolio and allows the creation of new synergies and growth opportunities,” says Giovanni Costantino, then Chairman and CEO of Tecnomar. “The acquisition enables us, therefore, to broaden the offer and to increase the presence of the Group in the market thanks to a brand that maintained its great appeal intact among the Owners all over the world”. “We are very proud of the acquisition”, underlines Giovanni Costantino. “We consider that the Group will be able to exploit to the utmost the growth opportunities”. Admiral offers 11 different series in steel and aluminum with 32 models between 37 and 145 meters, planning, semi-displacement and displacement. Every new construction is customized to coincide with the expectations of each Owner, thanks to an important stylistic culture and a competent Centro Stile within the Group.